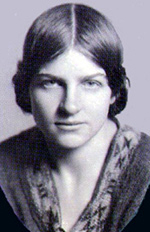 Naomi Mitchison, née Haldane, was born in Edinburgh, Scotland, the daughter of the prominent physiologist John Scott Haldane and his wife Louisa Kathleen Trotter. The biologist J.B.S. Haldane was her elder brother. She, too, initially sought a career in science. She was educated at the Oxford Preparatory (later Dragon) School and went on to study at at the Society of Oxford Home Students (later St. Anne's College, Oxford University). At the outbreak of World War I, she dropped out of Oxford and joined the VAD (Voluntary Aid Detachment) as a nurse at St. Thomas's Hospital, London. In 1915, Naomi and her brother published "Reduplication in Mice," an article in the Journal of Genetics, which was the first to describe genetic linkage in mammals. The following year she married Gilbert Richard Mitchison, with whom she would have 7 children, and after the war played an active part in his career as a Labour MP. Among their friends were Aldous Huxley and E.M. Forster. All Change Here: Girlhood and Marriage (1975), and You May Well Ask: A Memoir 1920-1940 (1979). Her husband was made a life peer in 1964, entitling her to call herself Baroness or Lady Mitchison, but she never did. Naomi Mitchison is currently considered a "single author." If one or more works are by a distinct, homonymous authors, go ahead and split the author. Naomi Mitchison is composed of 10 names. You can examine and separate out names.